The Zourman Drums hi-hat conversion module for ddrum4 SE replaces a standard ddrum4 or ddrum4 SE CAST hi-hat (hall effect-based sensor) with your favourite Roland hi-hat. The historical ddrum4 SE drum module was introduced already 2001 and have since then been one of the legendary giants on the market. But to get these real old propriety systems to work with new technology has been a big challenge – but after many customer requests of getting a replacement for the ddrum4 legacy hi-hat – a solution was created – The Zourman Drums Hi-hat Conversion Module for ddrum4. The solution is 100% plug and play (only ddrum4 SE hi-hat calibration needed) and handles Roland hi-hat pad (bow supported only) and the hi-hat control pedal through the two input connectors. 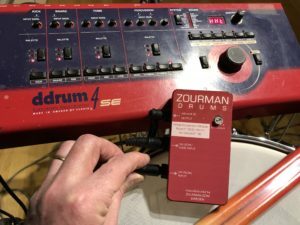 The Zourman electronics and intelligence combine the two trigger signals and deliver the output into a standard ddrum4 SE hi-hat input (single stereo jack). ‹ Adapter optimises CYs for 2box – A review in digitalDrummer! I own a VH12. Will this converter work with a VH12 and a ddrum 4 SE too?